On Thursday night I went to my very first blogging event. I’m not going to lie – found it quite strange. I don’t mean that in a bad way but the best I can do is liken it to going on a first date with a lot of people. There was a lot of friendly small talk. In case you didn’t know 27th of August is National Burger day. 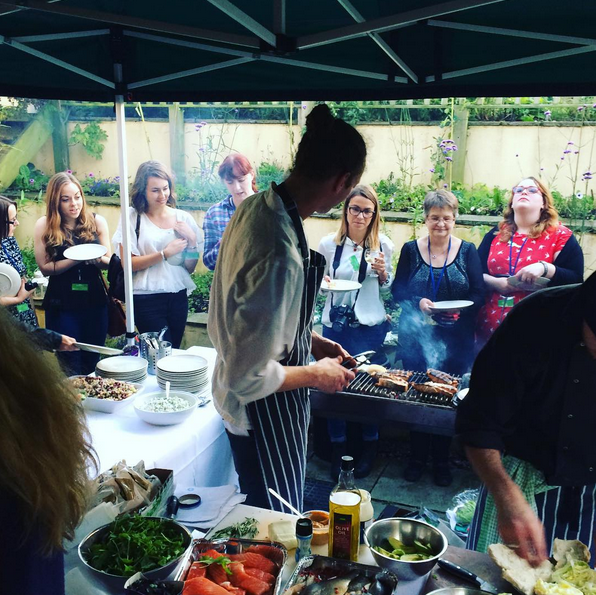 In celebration of this Asda hosted a MEAT up in the form of a pretty awesome BBQ. I was sceptical about going – I don’t eat meat. But there were all varieties of tricky- to-cater-to dietary-requirement options available. Some super hungry ladies – just as well there was food galore. To be honest, I didn’t pay much attention to the other options – like I said I don’t eat meat and haven’t for ten years as of this summer – so it would be daft for me to comment other than to say everyone seemed well fed and cheery, and the meaty, fishy and vegan options all got compliments all round. My messy, delicious plateful. Did I mention I love Halloumi? 1. Slice the halloumi and coat in olive oil. Place on the hottest part if the barbeque and cook for 1-2 minutes, turning every 30 seconds, until charred lines appear. Take off the BBQ and keep warm. 2. Slice the aubergine and cook on the barbeque until cooked. (Or prep your avocado, if you are me. 3. Split the buns, then toast, cut-side down, on the barbeque or grill. Spread the bottom half of each bun with the red pepper hummus, add the halloumi, aubergine (or avocado…), lettuce and tomato. Finish with the other half of the bun. Haha! These events do feel like a first date sometimes!! It was so lovely to meet you and hear your stories. I hope you had a lovely bank holiday weekend. “Friendly small talk” – perfect description! It was a fun event. Hope to catch up again another time.